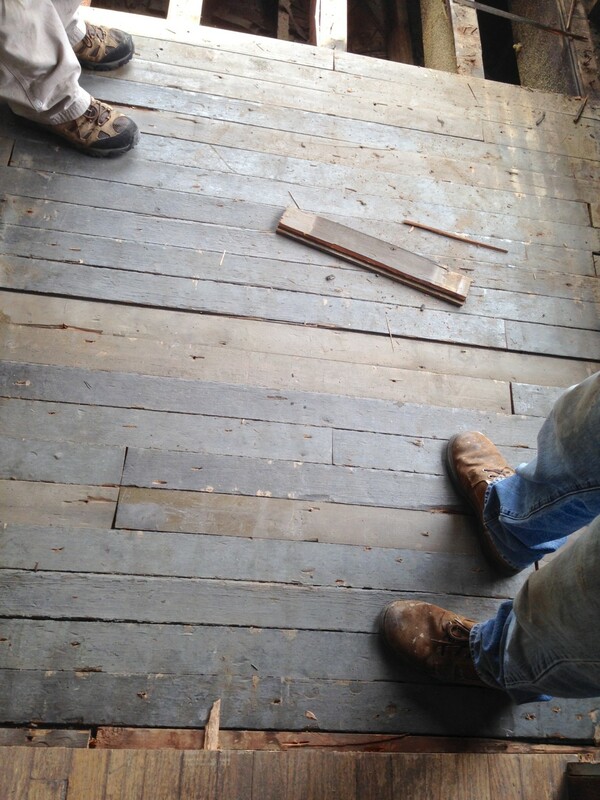 Today, we removed the non-original oak floor on the second-floor porch. 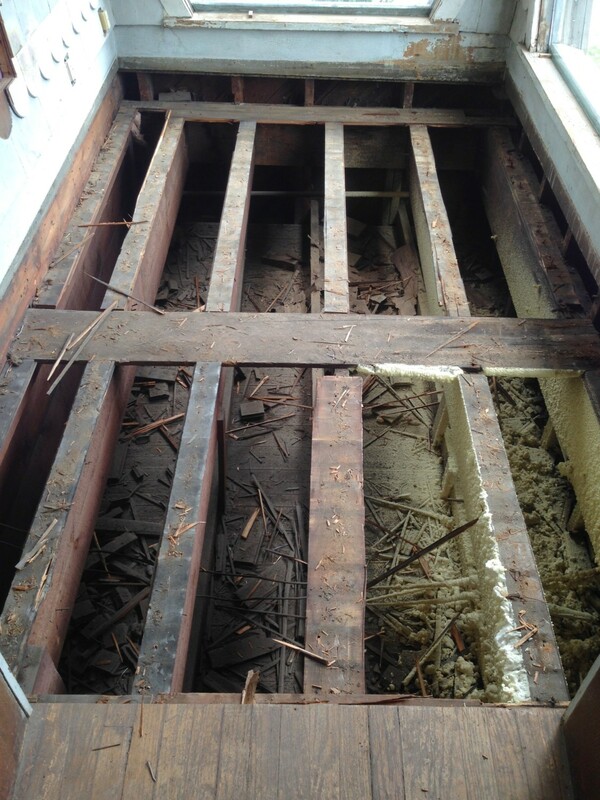 Under is a non-original pine floor. As I suspected, it appeared to be salvaged. 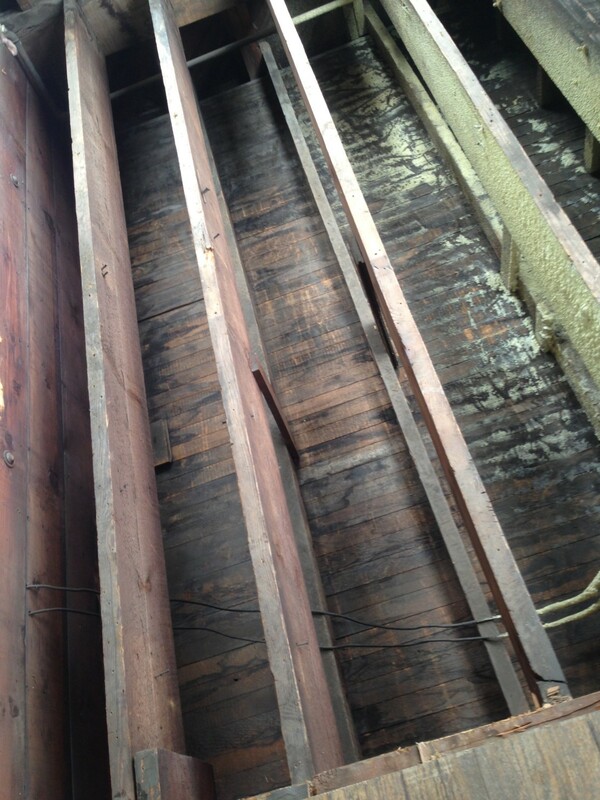 After the pine floor was removed, one could clearly see the mess left in the attic space when the original porch floor was removed. There was NO WAY a new floor was going in above such a mess, so I hauled out all the detritus and then, whoee, used the shop vac to clean up every inch. There are few things I enjoy more than a good vacuuming. When finished, I was entirely soaked with sweat, my bare, wet arms were black with dirt, and soon my aging body went into revolt at the exertions. As these words are written, I am sitting in chair. But can hardly otherwise move. My whole body feels like it has been run over by a truck. But..I don’t mind. Too much. To me, cleaning up a mess is powerful. I cannot prove the following, but nonetheless deeply believe in what I write. These thoughts are difficult to put into words, and right now I wish I were a poet. When the mess above was cleaned up, somehow, somehow, this changed the energy of the porch area. What had a dark kinda energy transmuted to a lighter, more vivid color. Gray transformed to an iridescent blue. And this new energy field will expand and caress the whole house. Over the last two years, as brutalized stained-glass windows were gloriously resurrected, as rotted porch columns were rebuilt, and as old exterior alligatored paint was removed and replaced with smooth lovely paint, all these acts changed the energetic field of the house. A stagnate, gray energy slowly started to vibrate, expand, and become ever more colorful. Dark energies then detached from the house and…dissipated. Somehow, somehow, this little part of the world is thus uplifted, and somehow, somehow, the universe is altered and a cosmic connection is created linking this glowing, wondrous energy with space and time across infinite distances. Somehow, somehow, life is then just a tiny bit better. Tomorrow, Justin and Jeremy will build the new porch floor, and their work will be more enjoyable working in a clean space. They, too, will feel better, and this will add to a glowing, wondrous energy. 13 Responses to Gray. 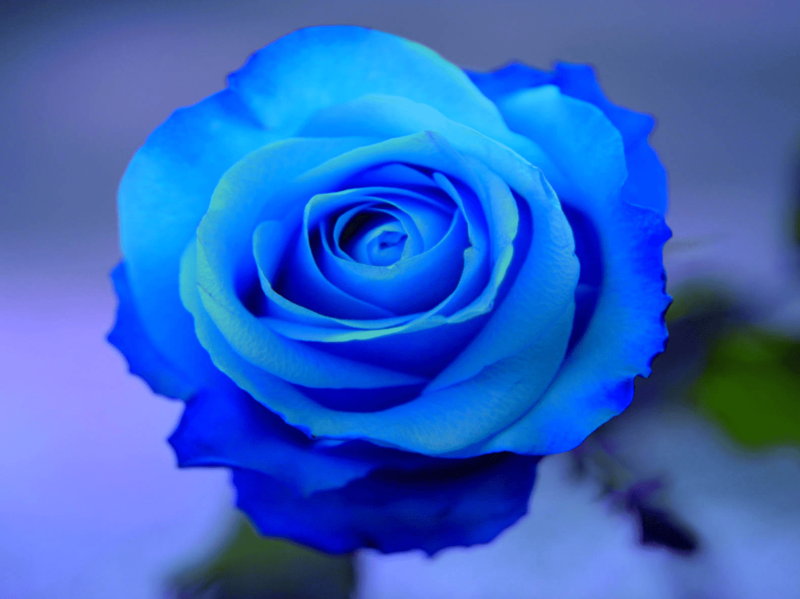 Then Blue. Last year I was giving a tour of the Cross House to somebody. When the tour was finished, my guest stated, with a smile, that I had OCD. I explained that I didn’t, actually. My guest smiled again, a little sympathetically, and told me that I was in denial. We went back and forth, with me explaining that my obsessive focus on the house was specific TO the house, to my desire to do a great job because I thought the house deserved it, and that I was not otherwise not like this in the rest of my life. My guest just kept gently, knowingly smiling. Realizing that this conversation was going nowhere, I abruptly said: Follow me. We walked to my car, and I opened the door. My guest took one glance at the MESS inside, gasped a bit, and said: Oh. You are SO not OCD! Ah, Ross, first the president referencing those verses in Elijah, I will turn your heart of stone. And now you, with these little things that aren’t really so little. And reminding me why I got and keep that big, badass shop vac! Good night and good rest. Thank you for all you do to make the world a better place. You stated that your OCD was specific to your house, but might I suggest that it is not exclusive as your restoration of light fixtures also seems quite meticulous. This is not a bad thing and I’m sure your customers reap the benefits. Having read your history, it’s still unclear to me as to how you ended up in Kansas and ended up buying this wonderful house, but as Briana said above, this house is lucky to have you….very lucky. As are we, for getting to participate in your journey from our armchairs! Have you had a chance to look at the ABOUT me page? It was kind of fun to learn about past lives of my bathroom from finding it (pink and black plastic tile) somehow held up on the backside of the kitchen ceiling. You ARE a poet, Ross! I do a mission trip every year with teens where we repair and renovate homes for elderly and underprivileged families. It’s hot (we’re in NC and so the heat index in June is always 100+), sweaty, dirty, HARD work. And I drive the kids on my sites crazy every year with how I have them clean up as they go. Especially after demo, I make sure they do a thorough clean-up right away before we do anything else. Things look less daunting and overwhelming when it’s clean. You can see the next step, and more importantly, the potential of what the space will be. That and I feel like it reminds the kids to take pride in their work. Not to cover up a mess just because, “no one will ever see it.” I tell them that cleaning up their work that no one will see is the same as demonstrating their true character by doing what is right even when no one is around to see it. I’m so glad to see someone else who is of the same mind. That makes me very happy. I agree about the cleaning up of mess that might never be seen. The satisfaction for me is that when I drop a tool, fastener, or piece of wood, I can immediately find it in a clean space and boldly press on. Before I pre-cleaned such spaces, I would often curse myself over the time wasted by the search through the detritus for a dropped nail or tool. Projects often took twice as long because of these searches. At times my energy would drop precipitously and I’d quit for the day, depleted, with an untold amount of time before I could get back in the swing. The momentum of success as you described in your post about installing one electric outlet setting you on the path to getting many more done would be reversed for me with a nail lost in the detritus, feeling sorry for myself. Procrastination for me is so often a result of breaking the momentum of what I intend to do. I hear ya’, Stewart, I hear ya’!